CE Marking can be regarded as a product's trade passport for Europe. It is a mandatory European marking for certain product groups to indicate conformity with the essential health and safety requirements set out in the European Directive. The prime aim of the CE Directive is to ensure that "all industrial products that are placed on the market do not compromise the safety and health of users when properly installed, maintained and used in accordance with their intended purpose. Users and third parties should be provided with a high level of protection and the devices should attain the performance levels claimed by the manufacturer." This book explains the meaning of CE Marking, its history, how the Directive can affect all manufacturers of industrial products, its current status, its associated quality management requirements, and how manufacturers can easily and cost-effectively meet the requirements for CE Conformance. BACKGROUND TO THE NEW APPROACH DIRECTIVES: European Directives; Transition Period and Overlapping of Directives; Application; Mutual Recognition Agreements/European Conformity Assessment Protocols; Types of Directives and Standards; Concurrent Application of Directives; Aim of Standardisation; International Standardisation; Harmonised European Standards; Revision of Harmonised Directives; Management of the List of Standards; Recognition of European Standards. 2. STRUCTURE OF NEW APPROACH DIRECTIVES: Articles; Adoption of New Approach Directives; Transposition of New Approach Directives; Advisory Committee; Review and Reporting; Transitional Provisions; Repeal; Entry into Force. 3. STRUCTURE OF THE CE CONFORMITY MARKING DIRECTIVE (93/465/EEC): Main Part; General Guidelines; Conformity Assessment Modules - Short Description; Choice of Module; CE Marking; Industrial Product Type conformity; Competent Authority; Notified Bodies; Essential Standards for Notified Bodies; Relevant Standards of the EN45000 Series for Each Module; Notified Bodies Tasks Under Each Module; Requirements of the Various Directives affected by CE Marking; Content of the Directives; Conformance; Principle Directives; Other Directives; Medical Devices - in vitro diagnostics (COM (95) 130) 180; Other Directives Associated with the CE Marking Directive. 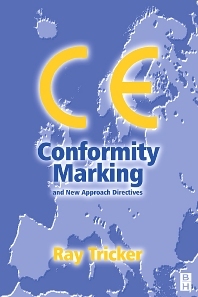 GAINING OF CONFORMITY: Self Declaration; Voluntary Certification; Mandatory Certification; The 5 Steps to Conformity; Quality Management System; Conformity Assessment Procedures; Conformity requirements of each Module; Conformance Requirements of New Approach Directives; Manufacturers; Manufactuer's Tasks Under Each Module; Basic Requirements of manufacturers of Industrial Products; Registration of manufacturers; EC Verification; Design and Construction Requirements; Index. Ray Tricker is the Principal Consultant of Herne European Consultancy Ltd - a company specialising in ISO 9000 Management Systems - and is also an established author. He served with the Royal Corps of Signals (for a total of 37 years) during which time he held various managerial posts culminating in being appointed as the Chief Engineer of NATO's Communication Security Agency (ACE COMSEC). Most of Ray's work since joining Herne has centred on the European Railways. He has held a number of posts with the Union International des Chemins de fer (UIC) (e.g. Quality Manager of the European Train Control System (ETCS)) and with the European Union (EU) Commission (e.g. T500 Review Team Leader, European Rail Traffic Management System (ERTMS) Users Group Project Co-ordinator, HEROE Project Co-ordinator) and currently (as well as writing books!) he is busy assisting small businesses from around the world produce their own auditable Quality and/or Integrated Management Systems to meet the requirements of ISO 9001:2008, ISO 14001 and OHSAS standards. He is also a UKAS Assessor for the assessment of certification bodies for the harmonisation of the trans-European high speed railway network.